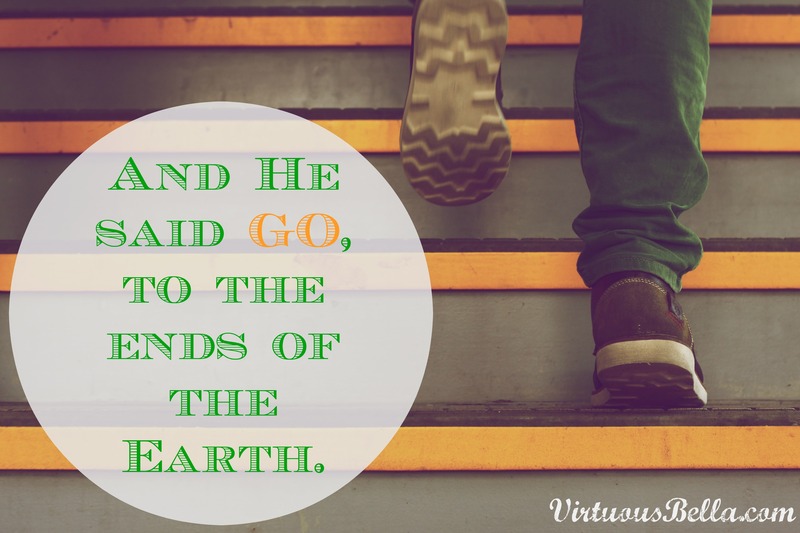 And He said GO, to the ends of the Earth. Do not be afraid. Such simple words, strong words, peppered throughout the scriptures. Do you know, sweet sister, that the Lord was speaking to YOU? His Word assures us in no uncertain terms that we need not be afraid, because where ever the Lord sends us He goes before us and comes behind us. He has commanded us to GO. As a woman who married young, had her children young, it has been harder for me to get up and go. We have finances to consider, but I also have to consider my husband’s schedule and make arrangements for my children’s schedules as well. When I am gone, there is still a family that needs to eat at home. When I leave for a period of time, I have a family who is begging me to come home. There are so many opportunities that come up that I would love to be a part of, yet He has placed me in a family, and I am to be a good steward with that blessing. My mission field begins with the children the Lord has entrusted into my care, that I bring them up in the way of the Lord so that when they are old they will not turn from it. For our single women, however, the world is before you to go and serve your fellow man. You are in a season of life where the Lord has gifted you a freedom to GO. Whether you choose to go to your local community center and volunteer your time with the people who share the same neighborhood as you, or you decide to board a plane and fly across the globe to serve the “least of these.” What stops you from taking on those adventures? Are you afraid? He says, fear not. Are you imperfect? You are made perfect in Him. Are you unqualified? He qualifies and equips those He calls. Are you called? If you are a believer, then the answer is yes. Now, just pray for the Lord to reveal where that calling will lead you. The Holy Spirit grants us gifts, talents, and skills that we are to use for the Glory of God wherever we go. Each day, as we walk out our front door, we are encountering the “least of these”. Each day, we become keenly more aware of the hurt, pain, and suffering in this world. Each day, we are presented with new opportunities to share the Healer, Comforter, and Rock with those who are pressed down by the weight of this fallen world. Your mission field starts right where you are. Will you say “Here I am Lord, send me.”? Because you, sweet sister, are ready to go and make disciples of all the nations starting with the ones in your neighborhood and to the ends of the earth. For you do not walk alone, but with the One, who redeems.